The interesting confluence (if not quite congruence) of two blockbuster touring exhibitions sharing special gallery space at this moment at the Art Gallery of Ontario in Toronto brings several potent issues revolving around image, identity, and representation in the post-modern age into a tighter orbit. Prominent Chinese contemporary artist Ai Weiwei’s According to What? show runs until October 27th, and the recently-opened David Bowie Is admits visitors until November 27th. Although the sprawling, multifarious oeuvre of the wildly-creative Bowie would initially seem to share little thematic ground with the focused conceptual provocations of Ai Weiwei’s work, they in fact provide fascinating opposing case studies into the contemporary construction of identity in the public sphere. Ai Weiwei may currently be the world’s most famous artist, his shaved head, scraggled goatee, and hardened gaze familiar features to any follower of current developments in the fine arts. Weiwei’s work, to a great extent, conforms to contemporary art’s dominant practice of large-scale abstraction and privileging of concept over form, signified over signifier. As such, it often shares the movement’s smugly self-confident pretention, its conviction of its vitality and importance in the face of evident self-indulgent conceit. Just how important, really, is a shark preserved in formaldehyde, or a turbine hall full of ceramic sunflower seeds (Weiwei’s famous installation at London’s Tate Modern), anyway? Most would say, and have said, not very. But even if his form follows that of major contemporary art influences like Jasper Johns, Marcel Duchamp, and Andy Warhol, its function, its meaning, is subtly modified and possibly even deepened by his engagement with Chinese cultural history as well as with the country’s current political situation. 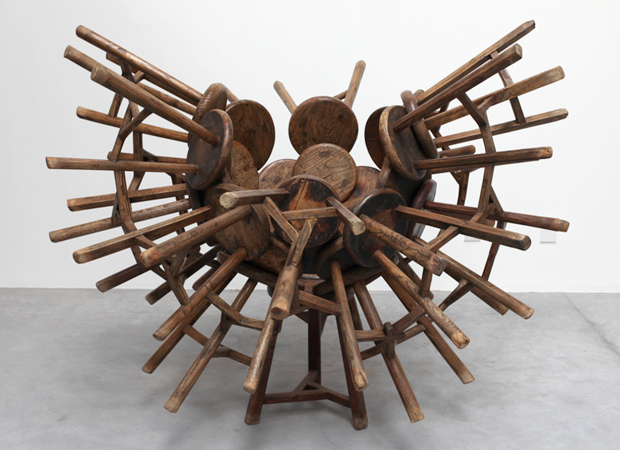 Weiwei often employs traditional Chinese fabrication techniques and materials in his works and installations, connecting the intellectual metaphors of conceptual art with the cultural bedrock of his nation. Examples in the According to What? exhibition include sculptures made of wood from demolished Qing dynasty temples that take the form of the map of China and a traditional rural woodpile, scaled-down house shapes made from pressed tea leaves, traditional wooden stools (constructed without nails) arranged in a vertiginous sunburst pattern, and Forever-brand bicycles attached in a circle, a suggestion of eternity that puns on the brand name. Weiwei does not merely adapt Chinese cultural tradition to more modern usages, however. He also challenges the sanctity of that cultural heritage with a series of works confronting contemporary China’s modernization efforts and its concomitant erasure of that heritage. He dips centuries-old vases into bright industrial paints, photographs himself dropping and smashing another vase from 2000 years ago, and paints a silver Coca-Cola logo onto Neolithic pottery. Is he defacing ancient and valuable artifacts, making them beautiful or meaningful in new and striking ways, or executing both acts at once in a commentary on the post-capitalist order’s own focus on progress over preservation? This would all be interesting enough fodder for contemporary art, but would not necessarily make Ai Weiwei a figure of the gravity and integrity that he has been invested with. Weiwei’s antagonistic relationship to and frequent challenges of the authority of the Chinese Communist state accomplishes that nicely, adding a note of agitprop frisson to the subtle wit of his works. His support of political dissidents and efforts to compel greater disclosure from the Chinese government with regards to the death toll and infrastructure failures of the 2008 Sichuan earthquake has gotten him arrested, beaten, and currently under house arrest, his passport confiscated, preventing him from travelling outside of China. These events have found their way into his art, as other works in the exhibition include a huge snake made of backpacks (5000 children died in the Sichuan quake, many in collapsing, shoddily-constructed schools) and a shattered wave constructed of rebar, salvaged from destroyed buildings and laboriously straightened for use in the sculpture. What emerges from According to What? is an artist whose presented identity is grounded in his country’s history and character as much as in the provocations of contemporary art. But even as he challenges the authoritarian system of China and engages with its rich and ancient culture, his processes of artistic production reflect the industrial and commercial underpinnings of that system. The Warhol-esque repetitions of his works require a large labour pool to achieve the desired effect; According to What? includes video of Chinese labourers hammering the aforementioned rebar straight, and the sunflower seeds were made by a ceramic works that once provided precious objects to the imperial court (the project saved it from bankruptcy, apparently). Is Weiwei exploiting the huge Chinese labour pool like the government whose record he often protests, or is he turning its almost immeasurable energies to more productive creative uses? As with most of Ai Weiwei’s creative interactions with the Chinese portion of his artistic identity, he leaves it largely up to interpretation. Speaking of identity left up to interpretation, David Bowie Is (put together by the Victoria & Albert Museum in London and featuring hundreds of items from Bowie’s personal archives) is a multifaceted examination of a popular artist whose many facets have been presented at different times. Spawned by a comfortable suburban English milieu, young David Robert Jones sought out substitute identities based on a variety of sources: Buddhist spiritualism, science fiction, German Expressionism, ambiguous sexuality, even mime. His boundless artistic appetite has expanded beyond music into design, art, dance and performance, and film acting. Indeed, perhaps the most contained expression of his chameleonic powers in the enormous exhibition is a screening room looping scenes from his eclectic cinematic career. There are also clips of performances, handwritten lyrics, letters, and notes, movie and stage props, photographs and posters, and a constant stream of Bowie’s varied musical output. Most revealing, however, are the profusion of costumes on displays (sometimes revealing in more than one sense of the word). From extraterrestrial jumpsuits to oversized Weimar cabaret outfits to kabuki-style robes to an iconic distressed Union Jack coat, it is made very clear that throughout Bowie’s image transformations, the clothes have always made the man in terms not merely proverbial but profoundly identitarian. Bowie’s wardrobe has not so much enabled his assumption of shifting identities as it has constituted it. There is no better illustration of David Bowie’s unstable but always precise image changes than all of these sets of empty clothes that he once wore, now standing idle on mannequins. What these concurrent shows by Weiwei and Bowie shows us, then, is that whether tethered to contemporary politics and national heritage or to only the whims of one’s imagination, identity is constructed through image, and image preconditions identity.